Nasheka Bryant stands with other Freedom Fighters. 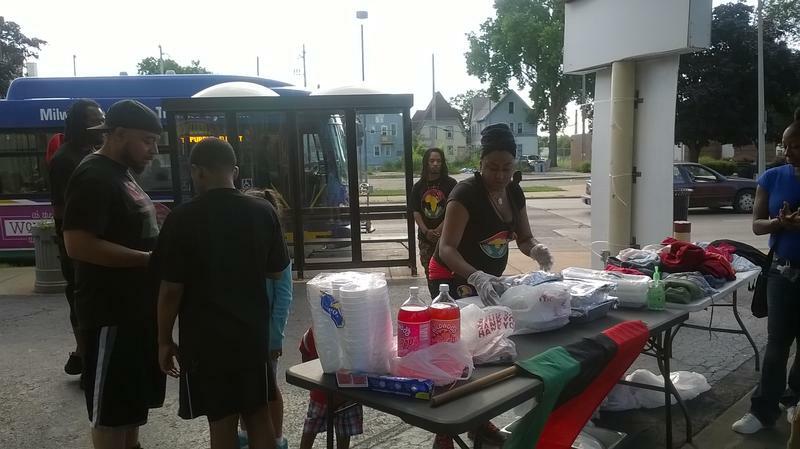 The Freedom Fighters also work to provide other services that support residents and improve the community itself. On a brisk March afternoon, the Bryants and three volunteers did a foot patrol, starting at 39th and Center near a corner grocery store. The route was simple: Center St. to Locust, and back around. While some of the five carried guns, one held a red, black and green Pan-African flag. Freedom Fighter Vern carries a Pan-African flag. There’s a reason the Freedom Fighters chose this starting spot. It was the site of a recent fatal shooting. The Center St. route, in memory of Emani, has become a regular one for the organization. Nasheka says in addition to doing regular patrols, the Freedom Fighters respond to calls for help from community members who reach out to the volunteers during conflicts or after shootings. Throughout the patrols, drivers honk, showing their support. In response, the Freedom Fighters wave and smile, sometimes raising a fist in a Black Power salute. Memorial for Emani Robinson who was shot and killed at 38th and Center in June 2017. Schlonda Holifield, who lives near First and North, says the Freedom Fighters have helped her in the past. She contacted the group by Facebook one night, when a man tried to break into her home. She says it was about 6:00 p.m. or 7:00 p.m.
Holifield says the group patrolled her neighborhood and stuck around to make sure the man didn't return. The Freedom Fighters say they intervene through a combination of patrols, one-on-one meetings, and group sit-downs. Jerome Curry, who lives in the Lindsey Heights neighborhood, says the Freedom Fighters helped him when his family had a conflict with a neighbor and her acquaintances. He says the conflict was turning violent. So he called the Freedom Fighters to help resolve the issue. Curry says initially he contacted police, but that aggravated the woman and her friends. He says he liked the tactics the Freedom Fighters used. "They don't intimidate us as much as the police...I think cops escalate the situation sometimes without coming and hearing both sides of the story." Back on the patrol, Nasheka said that defusing conflicts is only part of what the group does. “We have cleanups scheduled. We do feeds. Give out hygiene items. We actually have a youth division called the 'Future Fighters.' Hopefully, we can get that launched this summer. Mediations. Helping people find housing and shelter after being homeless. It depends on what they need, honestly, we’re here to help." During their patrol, the group stopped several times to check on people along the route -- a woman with health concerns, a family with a deaf child. The Freedom Fighters say they’re paying attention to an area of the city where the residents may feel abandoned. Nasheka checks on a resident along the patrol. “These people are so used to hearing negative, seeing negative and being treated negatively, that when someone comes around and there’s actually some positivity, they love it,” says Nasheka. As for those officers, Jerome Bryant, chief of the Freedom Fighters and Nasheka’s husband, has a bit of advice: “Well, for one, stop acting like they’re ‘keeping us in check.’ Like, you work for us, you work for the community." 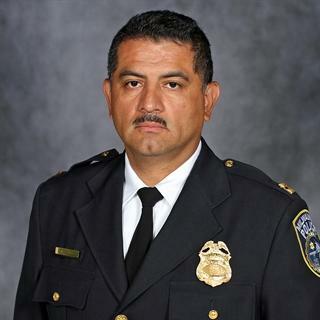 The organization issued an official statement in January after Milwaukee Police Chief Edward Flynn announced his retirement, and the Fire and Police Commission announced the search for an interim chief. 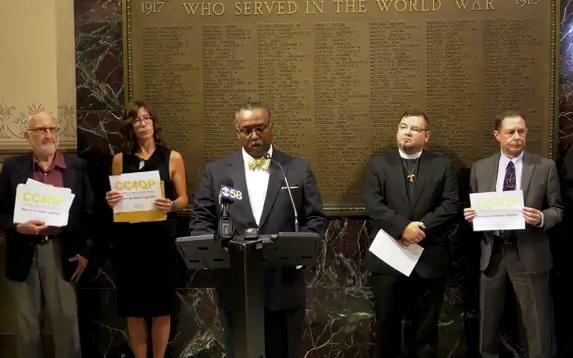 The statement encouraged a collaborative reform initiative. "Our tagline is -liberation through love' because you have to have a love of the people to do this." There are a lot of statistics that point to Milwaukee not being a good place for many African Americans. The high crime and poverty rates, and high achievement gap between black and white students, are just a few. 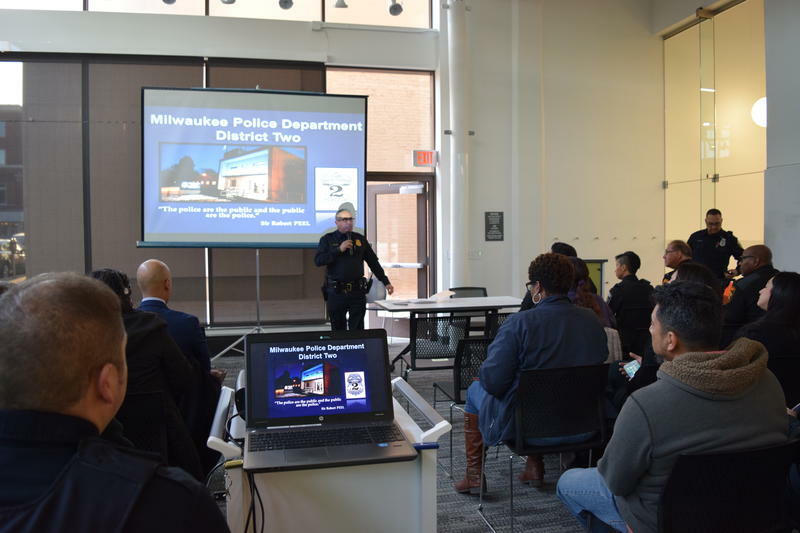 Several groups are trying to improve the lives of the city's black residents, including by providing both a safety net and public safety. WUWM reports on the group - The Freedom Fighters, whose name pays homage to those who came before.